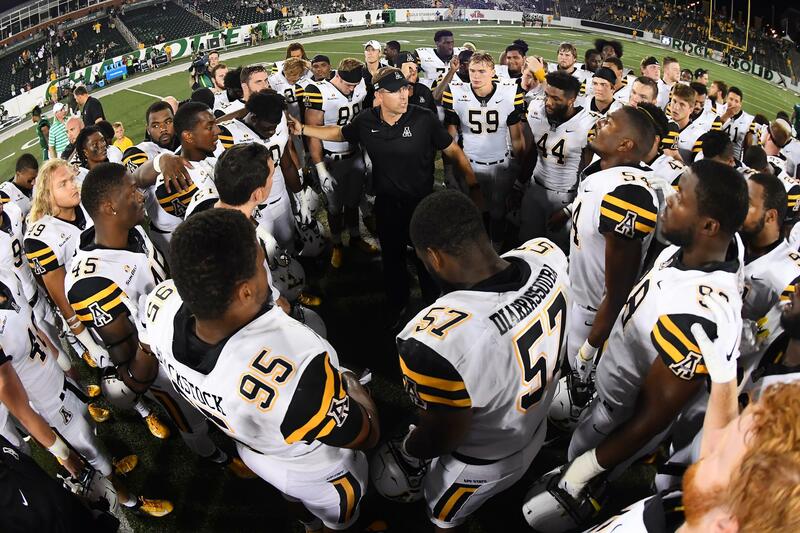 BOONE, N.C. — Appalachian State alum and football head coach Scott Satterfield has directed the Mountaineers to unprecedented success over his five-plus years at the helm, including a promising start to the 2018 season. On Friday, Chancellor Sheri Everts and the Appalachian State University Board of Trustees approved a two-year extension on his existing contract, effective through the 2023 season. Since Satterfield became the head coach at his alma mater, the former Mountaineer quarterback has led his teams to a 42-23 record, back-to-back Sun Belt Conference championships in 2016 and 2017, and three straight bowl victories from 2015-17. App State is the first program in FBS history to win bowl games in each of its first three eligible seasons after making the jump from the FCS ranks. The Mountaineers are 37-10 overall in their last 47 games, sixth-best in the country behind only Alabama, Clemson, Ohio State, Oklahoma and Wisconsin. Satterfield has led his teams to a 36-6 mark against Group of Five conference opponents in four seasons at the FBS level, including postseason wins over Ohio in the 2015 Camellia Bowl and Toledo in the 2016 Camellia Bowl and 2017 Dollar General Bowl. Under Satterfield’s guidance, App State has a league-best 27-5 record in Sun Belt games since joining the conference in 2014. Satterfield was named Appalachian State’s 20th head coach on Dec. 14, 2012. He is in his 23rd season overall with the Appalachian program, including five as a student-athlete (1991-95), 12 as an assistant coach (1998-2008, 2012) and six as head coach (2013-present). During his years as a player and assistant, he helped lead the Mountaineers to three NCAA Division I FCS national titles and eight conference titles. The Mountaineers host Gardner-Webb on Saturday. After a heartbreaking 45-38 overtime loss at No. 9 Penn State in the season opener, App State bounced back with a 45-9 road win against the in-state Charlotte 49ers in week two.